What would happen if we deployed a sensible “bundle” of policies all at once? How do individual policies compare, within that bundle? What about at a “maximum” level? What does maximum deployment look like? In the previous post, I looked at a few of the “big impact” policies. At the time, I focused on the “aggressive” deployment level. In this section, I want to switch gears to the “maximum” deployment level and dive a little deeper. Let’s take a look at a few of these policies in detail, and see what “maximum deployment” really looks like. How big is it? What does that feel like? The “aggressive” level of deployment reduces emissions by 4,410 MT and the “maximum” level goes much further, to 15,186 MT. This is the one policy where the maximum level is vastly bigger than the aggressive level. How big is the carbon price that produces these huge reductions in emissions? The challenge with prices like this is usually units: what does a “per-mile” or “per-gallon” tax really add up to, and how does that compare to existing taxes, or to a “per-tonne-of-CO2” price? As a Canadian, I find it very hard to relate to all of the U.S.-denominated prices, so I’m going to express everything in both imperical and metric units and in US dollars, Canadian dollars and Euros. US$0.60 / gal. US$1.25 / gal. US$2.40 / gal. US$5.00 / gal. Fair enough so far. It should now be clear that the both the “aggressive” and “maximum” taxes are fairly substantial. The graph below now takes a look at how that compares to the future price of gasoline, and also includes the existing US gasoline taxes. For comparison, I’ve also included several international 2010 gasoline prices at the left, so you can see how other countries’ existing tax policies compare to US tax policy. For the international audience: US$4/gal. = C$1.05/L = €0.80/L. the “aggressive” tax level is similar to doubling the US gasoline tax in 2015 and then growing substantially from there, concluding at something similar to existing Canadian gasoline taxes by 2050.
the “maximum” tax level starts at about 65% of the price of gas in 2015 and rises to about 90% of the price of gas by 2050.
the “maximum” tax level in 2015 is still lower than most European fuel tax levels – Spain and Austria paid a $3.10/gal. tax in 2010. Perhaps this sounds large. Let’s take a quick look at what the daily and weekly expense for a typical American driver would be. The “aggressive” tax has a fairly small impact on the average person. $6/week is affordable to most. The “aggressive” tax hits extreme commuters harder, and would probably have a bigger impact on these users. The “maximum” tax is large enough to have a real impact on the average driver, and a major impact on extreme commuters. How does it look as a carbon price? That gives a sense of how this pricing scheme looks to drivers, and how it compares to existing gasoline taxes. But what is its size as a carbon tax? As this list shows, the “aggressive” and “maximum” carbon pricing policies from Moving Cooler are significantly higher than existing carbon taxes around the world. In the end, this is the reality of gas taxes versus carbon taxes: there’s a long history of high taxation of gasoline, and high taxes are what are required to genuinely affect driver behaviour. By comparison, there’s little precedent for high taxation of carbon emissions generally, and tax levels remain quite low for non-gasoline products. This also means that the “maximum carbon price” policy may not be the most economically efficient way to start reducing emissions. If we treated all forms of carbon equally and set a carbon price of – say – $150/T, this would be high enough to decimate emissions in many other sectors, while still only having a modest impact on transportation emissions. In other words, it’s far easier to reduce emissions in the non-transportation sectors than in transportation. People place a very high dollar value on the benefits associated with driving. 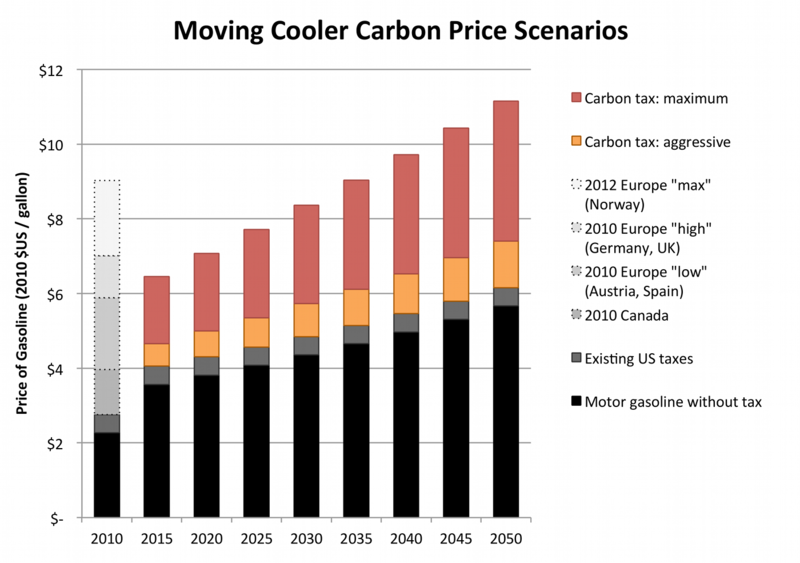 How does a carbon price change travel? Doesn’t it also require transit (etc.) investment? fewer trips: not making some discretionary trips, or combining multiple trips into a longer “tour” with multiple stops. switching modes: carpooling, transit, cycling, walking. Many of these modes are viable options without further government investment/promotion – they just aren’t quite as “nice” as they might be. The concept here is quite simple: lower the national speed limit to 55 mph (90 km/h) by 2015, with significant enforcement effort through speed cameras. The Nixon government implemented a national 55 mph speed limit in 1973 in response to an oil crisis, and those laws remained in effect until 1995. Enforcement appears to have been quite patchy, however; this initiative would require a serious enforcement effort, which is technically quite feasible using speed cameras. Speeds above 55mph are less fuel-efficient. Currently, 80% of vehicle miles travelled in large urban areas are at speeds above 55mph, and this rises to 97% of rural VMT. Interestingly, speed limit reductions reduce emissions in two ways: first, by shifting engines to a more fuel-efficient operating point; and second, by making driving significantly less attractive, especially for long distances. The delivery is also simple: a communications campaign, combined with mandatory driver education. In Sweden and the Netherlands, training in eco-driving is part of the driver licensing requirements, and also required before obtaining a taxi license. The “maximum deployment” scenario assumes a campaign that is sophisticated enough to reach 50% of the population with different parts of the message, and convince 40% of those reached to implement the eco-driving approach for a net effect of 20% of the total population adopting eco-driving. This policy is quite ill-defined and baffling to me, to be frank, particularly in terms of costing. The Moving Cooler study tries to build upon a separate study done by Cambridge Systematics called The Bottom Line. That report was done for the AASHTO highway organization, and its purpose was to make the case for more funding for all types of transportation. On the transit side, it doesn’t appear very substantive or coherent to me, unless there are some appendices with more details. This feels like a case of interference by the steering committee: “align with the AASHTO report!” the consultants may have been told, but that gives a really incoherent piece of analysis here. My interpretation of how The Bottom Line was incorporated into Moving Cooler is as follows. Future transit ridership growth is unknown; it might be 2.4% per year (the rate between 1995 and 2007) or it might be 4.6%. This policy looks at the emissions reductions and costs associated with 4.6% vs. 2.4% annual growth, in terms of maintaining current physical conditions and maintaining current service performance while accommodating growth. Accommodating growth does require construction of some new rapid transit (64% of the budget, apparently), and those are included here. In other words, it sounds like a set of potential emissions reductions and costs that will occur if ridership grows faster than it has previously. This isn’t really “urban transit expansion” – it’s more like “maintaining urban transit quality through limited expansion to meet demand.” Also, the cost estimate used here is essentially undefined – neither Moving Cooler nor The Bottom Line gives any real explanation of how the costs are built up, even though this is the second most expensive policy in the list. So, to me this policy is about “additional emission reduction that might happen if transit ridership surges,” and the cost associated with that surge is ill-defined. The “Transit Frequency / Level of Service / Extent” policy is more directly about improved urban transit – but it has a considerably lower impact, just 168 MT. I won’t go into detail on the other policies, but here’s a quick summary of what the top-rated policies are. Travel activity policies can have a real effect, up to a quarter of U.S. transportation emissions. Strong carbon pricing of some form must be a part of the mix to make a real dent in emissions; the majority of the reductions shown are due to the pricing policy alone, and the pricing policies have the highest potential early on. The two biggest travel activity policies are speed limit reductions and eco-driving. Capping speed limits at 55 mph (90 km/h) was done by Nixon in the 1970s and can be enforced today with cameras. A widespread eco-driving education campaign tied in to driver licensing can improve driver behaviour and vehicle maintenance in a meaningful way. Land use / smart growth policies are high priorities for immediate implementation. These policies have a high impact for low government expense. They are essential for eventually bringing transportation emissions down to zero, and they need decades of lead time to have a meaningful impact. Transit alone is probably not very large, but hard to determine because this part of the study is quite weak. Transportation emissions are much harder and more expensive to fix than energy sector emissions. The strong pricing policy shown here is equivalent to a 2050 carbon price of $570/T, which could well be sufficient to almost completely eliminate energy sector emissions.